The Ancestor Glade is one of several ancestor glades found on Tamriel. It is the only one located in Skyrim. It is so named for being home to swarms of ancestor moths. It is central to the quest Unseen Visions, although it can be visited anytime. 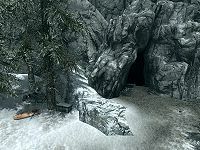 The entrance is high in the mountains, above the snowline east of Falkreath, south of Pinewatch. A few paces to the northeast of the entrance, behind a large rock is an old campsite complete with an extinguished campfire, with two pots hanging over it, one contains a salt pile and the other a venison chop. Beside the campfire is an ice wolf pelt, a snow bear pelt, a dead ice wolf, an unowned bed roll and a novice-locked chest. Everything in and around the campsite is marked as owned, and as such taking anything is considered stealing. Although you can skin the dead ice wolf without committing a crime. The entrance descends into an overgrown passage that leads to a dead end. Another path on the left follows the wall, before crossing a fallen tree, and into another short tunnel opening up to the main cavern. If you have not yet started Unseen Visions, you'll be ambushed by three spriggan earth mothers in the first area of the cave, regardless of your level. During the related quest, there is a wooden gate that will close behind you, as you enter the main cavern, to prevent you leaving prematurely. There are five Canticle trees found within the glade, which appear as trees covered with white and pink blossoms. During the related quest, they can be harvested for their bark. Before the bark can be harvested, you will require the draw knife, which is located by following the path from the wooden gate as it descends several flights of stairs. At the bottom a path passes under several square arches formed by a flat stones being placed atop two upright stones a few paces apart. In the center of an island surrounded by hot springs and shallow water is a strange stone shrine, with the knife in the center of the stone shrine. The knife is only obtainable during the related quest, it cannot be collected beforehand. There is one of the Canticle trees and several yellow mountain flowers nearby. The remaining Canticle trees are located; The first can be found by follow the outer wall to the left, from the wooden gate. Continuing past this you will find a large pile of rocks against the outer wall with a random potion and leveled potion of magicka on top. There are many piles of rocks, all found against the outer walls and all having items of treasure on top, unless the items have fallen off, so it's worth scouring the ground nearby and at the bottom in and around the hot springs, if an item is missing. From the wooden gate, following the outer wall to the right, you come to another pile of rocks with a medium coin purse on top. Continue following the wall down to the western corner of the glade and on yet another pile of rocks is a random dagger and random enchanted shield. From here your only option is to follow the stream towards the springs. From the shrine, there are stairs to the southwest. These lead up to a flat landing after a short distance and from here the path turns to the southeast. 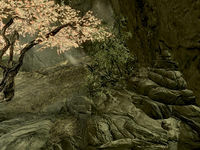 Continue past this to the southwest, passing across several more heated springs to the third Canticle tree, to the west of it is a pile of rocks, with a random enchanted greatsword on top. Following the stairs and path up to the southeast, bringing you to the top, with another flight descending from here heading northeast, the path continues with a rock wall on your right and a drop to the bottom of the glade on your left. Eventually you will reach the fourth tree. Following the outer wall beyond this tree will bring you to a pile of rocks with a random bow on top. From the fourth tree another path heads back the other way, to the southwest. More stairs continue climbing further, passing a pile of rocks with a filled random soul gem in a small stand on top of the rocks and on a lower rock below the stand are four loose septims, an amethyst and a silver jeweled necklace. Beyond these is a spring coming out from under the outer wall before dropping over the edge and forming the largest waterfall in the glade. Across the stream is the fifth and final Canticle tree. Just past this, concealed by a fir tree is a final pile of rocks where you will find a random enchanted helmet and a ruby. You will be above the first turning of the stairs, with a short drop from here. There are multiple swarms of ancestor moths all around the area, as well as a few gatherings that land on the flora around the glade. The former can only be interacted with during the quest, while the latter you are able to harvest like other insects for their wings for use in alchemy. Near the first tree, to the left from the wooden gate are the most that can be caught individually either landing on flora or flying on their own between patches of flowers. ‡ All found in the initial passage leading to the main glade. Once you've collected the knife, harvested the bark and attracted seven swarms of ancient moths, you will need to enter the beam of light near the shrine in order to read the Elder Scrolls of Blood. After reading the Elder Scroll, you will be attacked by a leveled group of either Dawnguard soldiers including an armored troll or vampires, including vampire's thralls, and a gargoyle, depending on your chosen side. These enemies will continue to respawn every few days, like any other dungeon inhabitant. They spawn in a group of five to six at the foot of the stairs leading into the glade; if you sneak, it's possible to accidentally walk right up to them. 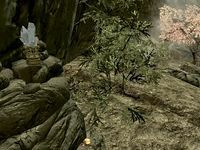 This location contains the largest and only non-quest-locked samples of yellow mountain flowers. During the related quest, the glade is unoccupied. It is highly recommended that you save before entering, especially during Unseen Visions, due to the number of reported bugs relating to the quest. This page was last modified on 8 April 2019, at 17:31.